Unbeknown to AbbeyPrint, work we produced on our large format printer helped get one of the world’s leading musicians out of a jam! Initially we were contacted by local company Black Cat Designs of Boston who asked if we were able to produce four 48″ x 36″ large format canvas prints at short notice which we agreed we could. 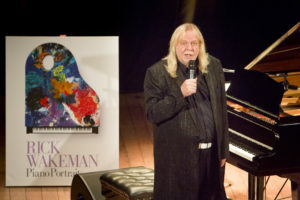 On receiving the files this turned out to be the artwork promoting Rick Wakeman’s “The Piano Portraits Tour” which Rick is currently performing throughout the UK and Europe. We produced the canvasses on our large format Epson Surecolour and then hand applied them onto 38mm wooden stretcher bars.